Green Open Access (self-archiving): The published work or the final peer-reviewed manuscript that has been accepted for publication is made freely and openly accessible by the author, or a representative, in an online repository. Some publishers request that Open Access be granted only after an embargo period has elapsed. This embargo period can last anywhere between several months and several years. For publications that have been deposited in a repository but are under embargo, usually at least the metadata are openly accessible. Gold Open Access (Open Access publishing): The published work is made available in Open Access mode by the publisher immediately upon publication. The most common business model is based on one-off payments by authors (commonly called APCs – article processing charges – or BPCs – book processing charges). Where Open Access content is combined with content that requires a subscription or purchase, in particular in the context of journals, conference proceedings and edited volumes, this is called hybrid Open Access. One of the most common ways to disseminate research results is by writing a manuscript and publishing it in a journal, conference proceedings or book. For many years those publications were available to the public under a payment by means of a subscription fee or individually. However, at the turn of the 21st century a new movement appeared with a clear objective: make all the research results available to the public without any restriction. This movement took the name of Open Access and established two initial strategies to achieve its final goal. The first strategy was to provide tools and assistance to scholars to deposit their refereed journal articles in open electronic repositories. The second one was to launch a new generation of journals using copyright and other tools to ensure permanent open access to all the articles they publish. 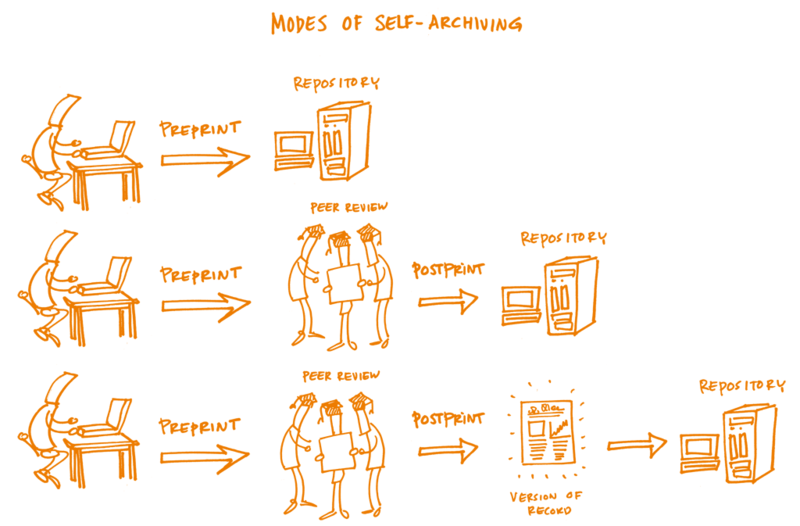 As a result of the first strategy we see self-archiving practices: researchers depositing and disseminating papers in institutional or subject based repositories. And as a result of the second strategy we have seen the creation of the open access journals that provide free access to readers and allow reuse of their contents without almost any restriction. Beyond those two strategies established in the Budapest Open Access Initiative in 2002, we have seen the growth of new methods of dissemination. Among them, we find the publication of preprints through institutional repositories and preprint servers. Preprints are widely used in physical sciences and now emerging in life sciences and other fields. Preprints are documents that have not been peer reviewed but are considered as a complete scientific publication in a first stage. Some of the preprints servers include open peer review services and the availability to post new versions of the initial paper once reviewed by peers. Following this trend of including open peer review processes in preprint servers we have seen the development of new publishing platforms supported by funders like the Wellcome Trust or the Bill and Melinda Gates Foundation . Even the European Commission is planning to to launch a publishing platform for the Horizon 2020 funded projects. The choice of a journal or a publishing platform may affect the availability and accessibility of the research results. There are several options for researchers when deciding where, when, and how to publish their findings. It is fundamental to know all the implications to avoid future problems. The rise of many business models around open access journals poses a lot of misunderstandings and uncertainties to the researchers when deciding where to publish. Moreover, paywalled journals offer individual open access models, the so-called hybrid model, that brings more complexity when deciding where and how to publish. Regarding self archiving, researchers are confused by the different requirements established by the publishers in relation with version of a paper that they can deposit in a repository and when this version can be available to the public. This delay in allowing public access to the full text is often called embargo period and it is not uniform for all the journals. Institutions who provide a repository for its researchers should facilitate self archiving practices by digesting all those publisher requirements. Learn about the different options a researcher has when deciding where to publish a paper, including funder requirements. Be able to decide if a paper can be published before peer review, for example in a preprint server. Trainees will learn how to determine which options they have according to their disciplines/journal policies, and if there would be consequences afterwards that might jeopardize final publication in a peer-reviewed journal. Trainees will learn how to discover the differences between policies of peer-reviewed journals, particularly when submitting something available as a preprint. They will learn the differences among open-access journals, such as which require a fee for submission/publication and which licenses they use. Trainees will learn about the implications of publishing in paywalled journals for future self-archiving in a repository, and the publisher requirements in terms of version and embargo. Trainees will also learn about hybrid open-access journals. (optional depending on audience) Trainees will learn about open-access opportunities when publishing in books, since this is the main avenue of dissemination for some disciplines. Trainees will learn about different business models used by open-access journals, and opportunities for obtaining funds to support publishing if needed. At the beginning of 2018 more than 4600 repositories are available for researchers to self-archive their publications according to the Registry of Open Access Repositories. In this list we can find institutional repositories, subject based or thematic repositories and harvesters. The first ones are generally managed by research performing institutions to provide to their community a place to archive and share openly papers and other research outputs. Subject based repositories are usually managed by research communities and most of the contents are related to a certain discipline. Finally, harvesters aggregate content from different repositories becoming sites to perform general searches and build other value-added services. It is fundamental for a repository to be harvested to acquire more visibility. For that purpose, repository managers need to follow standard guidelines regarding the use of metadata and the values of these metadata. Moreover, institutional repositories can be linked with other information databases to increase discoverability, for example PubMed offers the possibility to link its registers by the linkout project. Repositories have always been seen as an alternative way to access to scientific publications when accessing to the original source is not affordable. Currently there are tools like the Unpaywall browser extension that facilitates this alternative. When choosing a journal to publish research results, researchers should take a moment to read the journal policy regarding the transfer of copyright. Many journals still require for publication that authors transfer full copyright. This transfer of rights implies that authors must ask for permission to reuse their own work beyond what is allowed by the applicable law and unless there are some uses already granted. Among those granted uses we can find teaching purposes, sharing with colleagues, and especially how researchers can self-archive their papers in repositories. Sometimes there a common policy among all the journals published by the same publishers but in general journals have their own policy, especially when they are published on behalf of a scientific society. When looking at the self-archiving conditions we must identify two key issues: the version of the paper that can be deposited and when it can be publicly available. Regarding the version, some journals allow the dissemination of the submitted version, also known as preprint, and they allow its replacement for a reviewed version once the final paper has been published. Due to the increase of policies requiring access to research results, most of the journals allow to deposit the accepted version of the paper, also known as the author manuscript or postprint. This version is the final text once the peer review process has ended but it has not the final layout of the publication. Finally some journals allow researchers to deposit the final published version, also known as the version of record. In relation to the moment to make the paper publicly available, many journals establish a period of time from its original publication: the embargo period, which can range from zero to 60 months. Some journals include or exclude embargoes depending on the versions. For instance the accepted version could be made publicly available after publication but the published version must wait 12 months. The number of Open Access Journals has increased during the last years becoming a real option for researchers when deciding where to publish their findings. According to the Directory of Open Access Journals (DOAJ), currently there are more than 11,000 journals. Nevertheless is important to remark that an open access journal must provide free access to its contents but it also must license them to allow reusability. No legal notice must be legally understood as "all rights reserved". Although the definition of an open access journal does not include any condition about the business model, there is a fact that those journals are commonly known as journal where you have to pay to publish. This misconception is due to the fact that the most successful journals and the ones that got the highest impact follow this model. Nevertheless, a recent study shows that the majority of journals registered in DOAJ do not charge any fee for publication (Data available here). Currently many paywalled journals offer individual open access options to researchers once the paper is accepted after peer review. Those options include the publication under a free content license and free accessibility to anyone since its first publication. This model is commonly known as the hybrid model because in the same issue of a journal, readers can find open access and paywalled contributions. Usually publishers ask for a fee to open individual contributions. Recent studies show that the hybrid fees are higher than the average of the article processing charges in some pure open access journals (Jahn & Tullney 2016). One of the reasons researchers choose the hybrid model is to fulfil some of the requirements of funders policy, especially the ones requiring immediate public access to research results or short embargo periods. Some funders, have decided to establish their own publishing platforms to provide their grantees with a place to release their findings. In general, to publish in those platforms costs around 1000 € and all the materials are released under a CC BY license. The publication is not limited to papers, researchers can include, for instance, data and software. There is no previous peer review process and therefore researchers publish documents that only pass through a limited editorial review to check the format but there is not an evaluation on the content. Peer review is done in a transparent way allowing anyone to see who wrote it and what the comments were. After the open peer review, authors can upload updated versions of their papers accordingly. Some disciplines prefer to use other formats than journals to publish results, for instance books. Initially, publishers were very reluctant to allow researchers to self archive a full book or even a book chapter. However, some publishers have begun to adopt policies to facilitate it. On the other hand, some university presses have shifted their publication model to open access to increase the visibility of their contents, especially monographs. This change can be explained as an answer to the cuts in some of the expenditures in monographs due to the restrictions in library budgets. A common model for this open access university presses is to provide a free version in PDF and sell paper or epub versions (see for instance UCL). Moreover the creation of the Directory of Open Access Books have increased their discoverability. In a similar way than other journal initiatives, there have appeared some projects to join forces to establish a common fund to build open access monographs, for instance Knowledge Unlatched. Q: "If I publish my work as a preprint, it won’t be acknowledged - I will only receive credit for a peer-reviewed journal article." A: Many funders are acknowledging the growing presence of preprint publishing in their policies: Howard Hughes Medical Institute (HHMI), Wellcome Trust, the Medical Research Council (UK) and the National Institutes of Health (NIH) announced policies allowing researchers to cite their own preprints in grant applications and reports (Luther 2017). In addition, preprints help establish priority of results and may increase the impact - and citation count - of a later peer-reviewed article (McKiernan 2016). There are still some researchers reluctant to deposit other versions than the final published version. It is important to inform them about the copyright implications when they sign a transfer document. Avoid the misconception of understanding an open-access journal as a journal where authors must pay to publish. The author-pay model is just one of the existing business models for an open-access journal. You might show data about the number of journals that do not ask for a publication fee (for example, as of 31 January 2018, DOAJ reports that 71% of the 11,001 open-access journals listed require no publishing charge). You may want to show other business models like the SCOAP3 Initiative, the LingOA project, or the Open Library of Humanities. The use of publishing platforms has implications for research evaluation, the peer-review process, and the role of publishers. There are still many research assessments based on journal metrics and therefore this new way of publishing challenges those evaluations. Moreover the fact that peer review is completely transparent allows readers to identify reviewers and track the versioning of the paper. Finally, if those platforms become the common tool to publish results, publishers would need to redefine their role in the scholarly communication process. The hybrid model is very controversial and it could raise a lot of questions about the costs, possible double-dipping, and the use (or lack) of licensing. You may discuss the future of the scholarly communication by presenting some of the offsetting models or transition projects like OA2020 global alliance proposed by the Max Planck Society. Trainees will be able to choose where to publish their research paper, describing the implications and consequences of this choice. Trainees will be able to determine the self-archiving policy of a journal where they want to publish based on the information available at the corresponding website or at any of the portals that provide general information as Sherpa/Romeo, Dulcinea, and Heloïse. Trainees who want to establish a new open-access journal will be able to describe their own self-archiving policy, license, and business model. Trainees who manage repositories will be able to describe the tools and services that allow researchers to self-archive.